EspañolThe Payá family has not lost its nerve, nor its hope, in their struggle to clarify the circumstances in which Oswaldo Payá died two years ago. Payá was a prominent activist, member of Cuba’s political opposition, and founder of the Christian Liberation Movement. Tuesday, July 22, marks the second anniversary of the traffic accident that killed Payá, along with 32-year-old Harold Cepero. The cause of that accident remains in doubt. 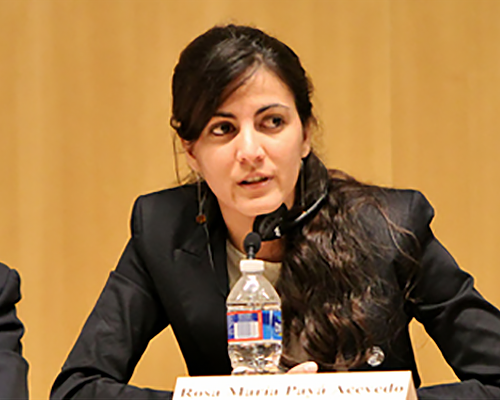 Rosa María Payá, daughter of the Cuban dissident, has continued to struggle for Cuba; a struggle her father had been fighting since the 1980s. At only 25 years of age, she along with her family have brought Oswaldo Payá’s case before international organizations to request an independent investigation of her father’s death. The Payá family believes that the Cuban government caused the car crash that killed Oswaldo Payá and Harold Cepero. They say another vehicle rammed into the car carrying Payá, Cepero, and two others: a Swedish man and a Spaniard named Ángel Carromero. Carromero, the driver of the vehicle, is serving out a prison sentence in Madrid for vehicular homicide, despite pleading innocent and demonstrating evidence of an attack. Rosa María Payá now openly states that she believes Cuba’s government, the European External Action Service, and the Spanish government have conspired to cover up the truth: the Castro brothers murdered her father. In an interview with the PanAm Post, she explains her reasons behind her controversial allegations. She complains that the Swedish government ceded to the Cuban government’s claims that the Swedish passenger, Aron Modig, suffered from “amnesia” and was unable to contribute to the investigation. She also says that the Spanish judiciary has repeatedly dismissed requests for an independent investigation as to whether or not Carromero was indeed culpable for the crash. “The Spanish government knows, and probably knew it before we did, that what happened wasn’t an accident. They received messages from Ángel [Carromero] asking for help in which he said it wasn’t an accident. Ángel has said they didn’t crash into a tree,” explained Rosa María. She further added her regret that the Spanish government has denied Carromero’s request for a pardon, considering the lack of clarity in the incident. She also states that her father’s case has been a point of division within Spain’s ruling party. The Popular Party is tasked with awarding the Oswaldo Payá Human Rights Prize, even though they do not official support the family’s humanitarian requests. “Some of the Spanish executive authorities, when they weren’t part of the cabinet, were stronger critics of the Cuban government and friendlier with the Christian Liberation Movement. They are actively protecting the Cuban government, with their silence and [lack of] action. History will not remember them well,” stated Rosa María. The only open case that remains considering the possibility of an attack on Payá and Cepero is with the UN Special Rapporteur on Extrajudicial, Summary, or Arbitrary Executions. The young Payá also said that the changes introduced on the island will only make Cubans more dependent on the government. She says, for example, that the concessions to open a small business are not backed by private property rights. Rosa María invites people to attend the events taking place on Tuesday, July 22, in Miami, Madrid, and Cuba, to honor her father Oswaldo Payá. Memorial events in Miami will include video presentations on the lives of Oswaldo Payá and Harold Cepero at the Varela conference room at Our Lady of Charity National Shrine. Afterwards, a mass will be held in honor of both victims. July 22 marks two years since the death of Oswaldo Payá. What events will be held in his honor? On Tuesday, July 22, we will be showing a documentary about my father and a short video about Harold Cepero, a leader of the Christian Liberation Movement who also died in the attack, at the Varela conference room at Our Lady of Charity National Shrine, Miami, at 6:45 p.m.. Then, at 8 p.m., a mass will be held in honor of my father and Harold Cepero. A mass will also be held in Madrid, as well as other tributes and memorials in Cuba. What is the status of the investigation into your father’s death? We decided to communicate directly with the United Nations (UN). The rapporteur on extrajudicial executions of the UN is constantly communicating with us. We filed a lawsuit, which is still in progress, for the attack against my father and Harold Cepero. They already started to ask the Cuban government for information, but it keeps giving them the same inconsistent and false version. On the other hand, we have tried really hard to open an investigation in Spain, but so far, the Spanish courts have avoided our case. In fact, they dismissed the complaint we filed. Why did they dismiss the complaint? They allege that there is no reason to open a case, because the Spanish government has accepted the version that the Cuban government maintains. It is very surprising because we are talking to the judiciary, not to the executive. We cannot explain how the Spanish government uses the cloudy opinion of the Cuban executive as an excuse. What was made clear enough was the last statement from the Spanish minister of justice, who decided not to pardon Ángel Carromero, the one driving the car when they were attacked. We must remember that the Spanish government knows that what happened on July 22 was not an accident, since they received a call from Carromero before the trial and all the intimidation against him. He told them that it was definitely not an accident. What is the Cuban government’s version? Why does the Payá family believe this version is distorted? My father, Harold, s Spanish man named Ángel Carromero, and a Swedish man named Aaron Modic were on their way to Santiago de Cuba, while being chased by state security vehicles since leaving Havana. Eventually, one of those cars hit them from behind. They lost control of the car for a moment until they managed to stop. Then a group of men came in another vehicle and took the Spanish and the Swedish man out of the car. They were probably beaten because they lost consciousness and woke up right when they were supposedly being taken to the hospital. Meanwhile, my father and Harold, who were alive, were left behind. However, a few hours later, we were told that they had died. The driver, Ángel Carromero, did not have any bodily injuries, or even remember [the car having] any broken windows. Carromero and Modic say that the car never crashed into a tree, as the Cuban government affirms. Moreover, it is well known that Modic left Cuba through a pact of silence, which the European Union Foreign Service and the Swedish foreign minister were involved in. Given this pact of silence, and the agreements between the Spanish and Cuban governments, it seems ironic that the Spanish Popular Party awarded a human rights prize to your father. How do you put this together? There are a lot of people from the Popular Party that have supported us [and our requests] to start an independent investigation. However, the position of the Spanish government has always been clear, since they backed what the Cuban government said. They say that it was necessary in order for them to be able to take Ángel Carromero out of Cuba. What do you make of the so-called reforms in Cuba? What would you say to the average US citizen that may believe things in Cuba are truly changing? In Cuba, some reforms have been made, but they don’t have anything to do with a democratic transition. It is clear that the Cuban government is selling concessions not only to some people from their government but also to foreign investors. [This is done] in order to maintain their positions, extend their time in office, and control all the resources that belong to the nation. People [in the United States] are free to give money to the Cuban government, but that will definitely not lead to a democratic transition. Translated by Mariana Nava and Adam Dubove. Elisa Vásquez is a Venezuelan journalist with experience covering social and community topics. Her specialty is human rights education and international solidarity. She reports from Panama City. Follow her on Twitter @elisavasquez88.